The production values presented here are based on EIA’s monthly survey of crude oil production, which, for reasons explained in a webinar presented earlier this week, are considered more comprehensive and reliable values of U.S. crude oil production than the preliminary estimates presented in EIA’s Weekly Petroleum Status Report. 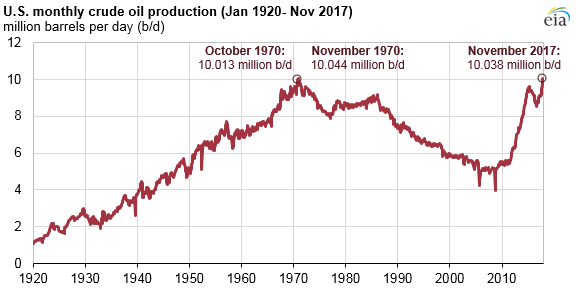 U.S. crude oil production has increased significantly over the past 10 years, driven mainly by production from tight rock formations including shale and other fine-grained rock using horizontal drilling and hydraulic fracturing to improve efficiency. EIA estimates of crude oil production from tight formations in November 2017 reached 5.09 million b/d, surpassing a previous high of 4.70 million b/d in March 2015. These formations also produce considerable volumes of natural gas associated with the crude oil. Liquid production—both crude oil and condensate—from tight rock currently accounts for about 51% of total production. A decade ago, in November 2008, production from tight formations accounted for only 7% of total U.S. production. Non-tight oil production has been mostly constant over the previous decade. Tight oil production can be sensitive to changing oil prices. After increasing relatively steadily since 2011, tight oil production began to decline after the West Texas Intermediate (WTI) crude oil price decreased from $105 per barrel (b) in June 2014 to a low of $30/b in February 2016. WTI prices were about $60 a barrel in January 2018. Production continued to increase through these price fluctuations in three formations in the Permian Basin—the Spraberry, Bone Spring, and Wolfcamp plays that span parts of western Texas and eastern New Mexico—and in the Bakken formation in the Williston Basin in North Dakota and Montana. The volumes shown here for each play are geologic formation subsets of the regional values presented in EIA’s Drilling Productivity Report. Monthly values of tight oil and shale gas production from selected plays, compiled from oil and natural gas operator reports to state agencies, are available on the crude oil and natural gas production pages of EIA’s website.